1 of 4 Heat oven to 350 degrees F. Line 8-inch-square baking pan with 18-inch length of aluminum foil, letting excess foil hang over sides. Lightly butter only bottom of pan. 2 of 4 Combine flour, butter, brown sugar, ginger, cornstarch and salt in food processor. Whirl until ingredients come together, 20 to 25 seconds. Stop machine before mixture forms a ball. Press mixture evenly into prepared pan. Prick with fork. Mark 25 squares using fork tines. 3 of 4 Bake in 350 degrees F oven until very light brown around edges, 25 to 28 minutes. Go over dividing lines again with fork, if faded. Let cool 10 minutes. Remove from pan, lifting foil ends. Cut into 25 squares with serrated knife. 4 of 4 Melt chocolate and vegetable shortening in small saucepan; stir well. 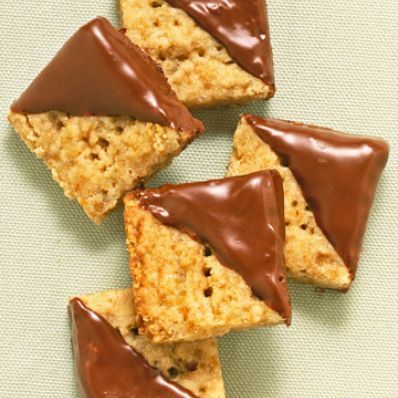 Dip cookies diagonally into chocolate and lay on waxed paper. Refrigerate until firm.